Starting an app development company is one of the most rewarding things you’ll ever do. Or it sends you into bankruptcy and despair. If only there was a guide out there, to help you along the way. This book is your guide to starting, running, expanding, buying, and selling a development consulting firm. But not just any consulting firm, one with a focus on Apple. Apple has been gaining adoption in businesses ranging from traditional 5 person start ups to some of the largest companies in the world. 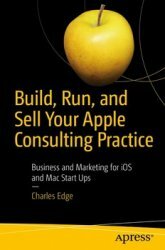 Author Charles Edge has been there since the days that the Mac was a dying breed in business, then saw the advent of the iPhone and iPad, and has consulted for environments ranging from the home user to the largest Apple deployments in the world. Now there are well over 10,000 shops out there consulting on Apple in business and more appearing every day.